Which one of these combinations is appropriate for an open-lid, easy-to-care terrarium? 1. arrow-leaf plant, fittonia, wandering jew 2. arrow-leaf plant, wandering jew, pothos 3. polka dot plant, arrow-leaf, spider plant, pothos 4. purple passion, arrow-leaf plant, polka-dot plant, pothos I live in 9a/10a zone, and I want to place my terrarium 3 feet from a west window. I would avoid the Pothos and Spider Plants for a terrarium, since they have a hanging growth pattern. 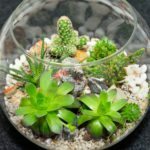 The remaining plants you mention will work as small terrarium plants. Here are some articles for you with more information.